OMPL Recruitment are 33 posts. 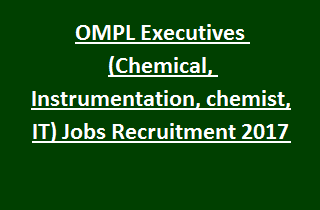 Candidates who are interested for these Executive vacancies are advised to go through the official website of OMPL www.ompl.co.in. Click on the OMPL official web link, apply for desired post. Online application process starts from 18-October-2017. Closing date for OMPL application submission is 18-November-2017. Candidates will be shortlisted based on GATE Score and Personal Interview. Pay Scale for these Executive Jobs is Rs. 4,00,000/- per month. Maximum age limit for OMPL Recruitment is 28 years. General candidates need to pay Rs. 750/- as application fee. No application fee other category applicants. Further information regarding Examination fee, Application Procedure, Selection Process, Pay Scale, Interview dates of ONGC Mangalore Petrochemicals Limited OMPL Recruitment Executives Jobs are mentioned below. Call Letters available from: 21 days before the date of Interview. Total vacancies available in ONGC Mangalore Petrochemicals Limited OMPL Recruitment are 33 posts. Post Name: Executives: 33 posts. 4. Information Technology: 01 post. Candidates must have passed BE/ B.Tech or equivalent qualification from recognized university. GATE Score will be consider for selecting candidates. Please check the OMPL notification for further details. Pay Scale for Executive Jobs is Rs. 4,00,000/- per month. Maximum age limit for Executives Jobs is 28 years. OMPL Recruitment selection is based on Merit in GATE 2017 score and Personal Interview. Hall Tickets will be available from 21 days before the date of Interview. No application fee for other category candidates. Eligible candidates have to go through OMPL official web link www.ompl.co.in. Open the recruitment link and apply for selective stream. Application form submission starts from 18-10-2017. Closing date for OMPL application submission is 18-11-2017.